Are you in Paris this Halloween? Wondering what there is to do? 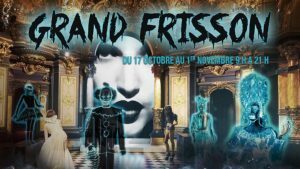 We’ll tell you about some of the best things to do and parties going on for Paris Halloween 2016. 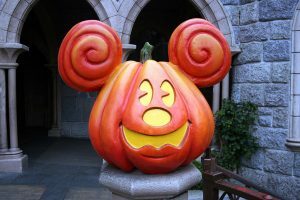 At Disneyland Paris you can see all of your favorite Disney characters and the theme parks’ spooky decorations. From October 1st to November 2nd. See online for details. At Parc Asterix you can see the halloween decorations too. The theme is Peur sur le Parc or Fear Over the Park. They have three haunted houses too! From October 15th to November 2nd. Read more here. Check out a real American-style haunted house with over three stories of actors dressed up in all sorts of ghoulish characters. See if you can fight the fear within the walls of this haunted house. October-November with varying days based on availability. You can go dressed up but no masks and it isn’t recommended for children under the age of 12. Tickets are roughly 27 euros with discounts for under 16. 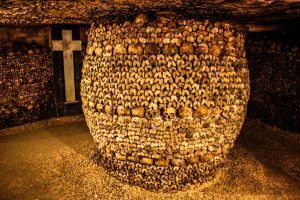 At the Catacombs you can see where over 6 million bones from various Parisian cemeteries lie. Make your way through the maze of tunnels. Pretty spooky if you ask us! Open Tuesday till Sunday from 10 am till 8:30 pm. At this wax museum you can find many famous people and snap some selfies with them. You can either do a normal visit during the day or a special Halloween evening visit of this museum! During this Halloween evening visit, you are invited to celebrate le Comte Eustache Fleury de Maslestra’s 193 years. Enter his cabinet of curiosities and you’ll find all sorts of frightening things! These special evening visits run the 17th of October through November 1st. 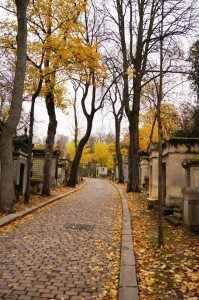 What better to do for Halloween than to visit a cemetery and not just any cemetery but the most famous in Paris! Here you can find buried celebrated figures like Edith Piaf, Jim Morrison, and Oscar Wilde. Read our blog post about the 10 most famous people buried here. And to add to the fun you can ask for a guided tour to discover funny anecdotes and stories about the celebrities buried there. Experience a murder mystery production as you walk in the Latin Quarter. You’ll pass the Panthéon, the Sorbonne, and Musée de Cluny as you try to figure out who murdered Iris Levert. This show is only available in French. Celebrate Halloween with a night that promises to be amazing with a DJ lineup that will keep you dancing all night. Wear your costume and get a discounted ticket price. 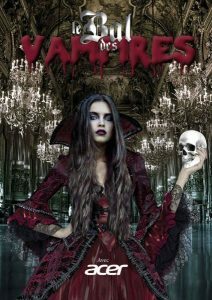 Join the first edition of this Vampire Ball, but don’t forget your costume (its obligatory!) Located in the Pavilion des Champs-Elysées, it’s bound to be unforgettable. From 23h-5h (11pm-5am). Buy tickets here. A party like the crazy parties of the 80’s! A mix of clubbing and cabaret but the freaky edition. The resident DJ will play an assortment of music. Free for the first 100 people, 10 euros after. Starts at 11:30pm. 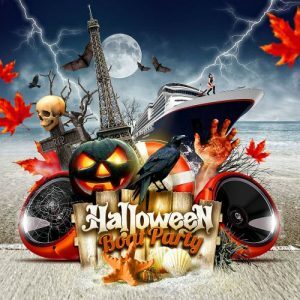 Celebrate Halloween in Paris 2016 in Red Light Paris, one of the largest nightclubs of the city. Reminiscent of the clubs of Ibiza you can dance the night away. Come after work hours and stay on till the evening and clubbing portion. Discover their haunted place full of frights! Panoramic view 180 degrees. VIP packages from 140 euros and up.